We offer our clients the best real estate product from the perspective of architectural design, landscaping, management with administrations and study of the business profitability. Our most recent advisory-architecture project has been undertaken in its entirety. e.-Feasibility Development: Calculation of the necessary investment and future profits the business offers. The key to the project is to develop a quality real estate product, oriented towards changing the mindset of the consumer in relation to theDelta Area. The project is directed towards a middle/high end consumer and has the objective of becoming a destination of reference both nationally and internationally. It is oriented towards tourism that values nature and the Slow Life movement. The land is located in an area with many inherent qualities being on the Ebro River and by the Mediterranean Sea. It offers the customer empty beaches, sports, fishing, birdwatching, photographic opportunities, cycling, boating, aquatic sports, and extraordinary gastronomy, among other things. After a thorough search of different areas of the Delta del Ebro, most of which is protected as a Natural Park, we came upon a very interesting plot of land, which is located on the city limits of Deltebre. It was formerly an 8 hectare farm with 300 linear meters on the banks of the Ebro River. The project is organized around the existing buildings, which will be renovated for restaurants, a hotel and a spa. 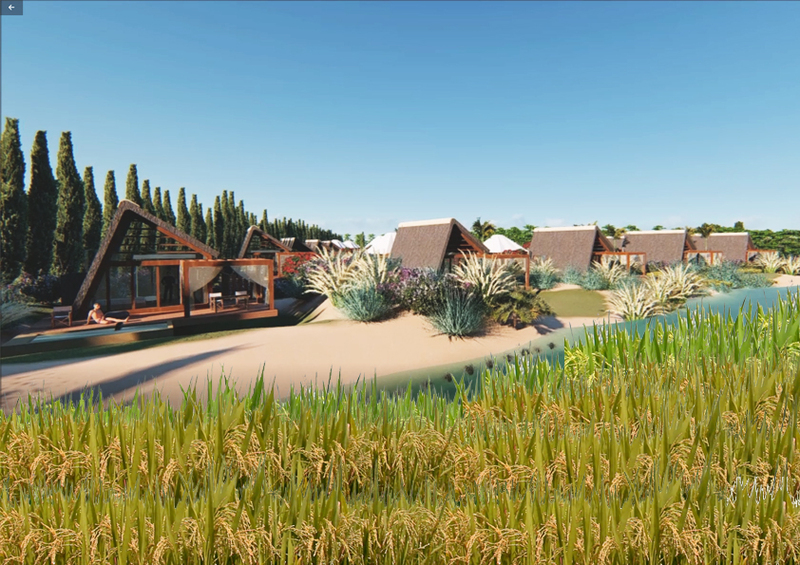 Bungalows inspired by the traditional delta architecture will occupy the rest of the plot, in combination with luxury camping tents. There is also the possibility of a “beach club” with a swimming pool and terraces overlooking the river. It is planned to include sports facilities. The fact that the land is on the banks of the river, the existence of a pedestrian/bike path following the river and the possibility of adding a floating mooring ramp which the guests could use to access the sea and explore the river were deciding factors in the choice of this land. Landscaping is also an integral factor in the project. It is inspired by the local agricultural countryside, with its orchards and gardens, rice fields, as well as white sand dunes present on the beaches of the Delta. It is a unique topography. The restaurant will be located in one of the main buildings and will be run under the concept of Zero Kilometers. The delta offers a wide range of products: fish, meat, rice, garden vegetables, olive oil, fruit and local delicacies. It is also planned to inspire the guests to learn about traditional local dishes. Quality tourism is what is being sought, clients who appreciate contact with natural rhythms as well as sport. It will be a place to disconnect and find personal equilibrium, all in the context of excellent service. Inspiration by local vernacular architecture has been a constant in the projects designed by Bc Estudio Architects . The bungalows are inspired by traditional delta constructions. As part of the marketing project we have created two videos, one of which is meant to communicate the sensations and experiences offered in the Ebro Delta area. The other video is a 3D visualization of the project itself withs segmentation of the potential customers.